A classic quarter sawn oak desk from about 1915 shows Arts and Crafts influence. The restored finish is in excellent condition on this antique library or office furniture. There is a loss under the far left edge of the top as shown. 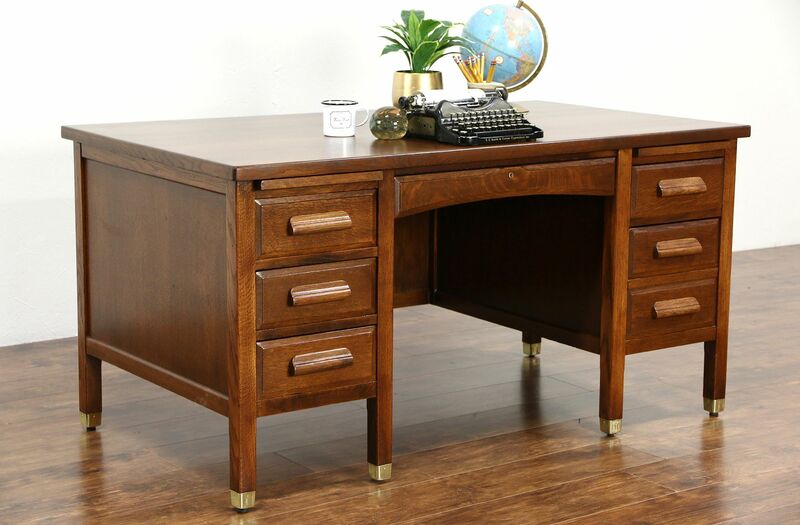 Deep drawers have dovetail joints and original carved oak pull on this American made unsigned desk. There is a file drawer and two pull out shelves. Brass feet protected the legs in the days of mopping floors. Size is 5' wide, 34" deep and 30" tall, the knee room is 26" wide and 24" tall.